Camino Walking Blind - Be your true self! Since 2015 we organise Camino Walking Blind every year. We have made a documentary of the 2016 edition. When the documentary will be available online we will let you know. A group of people with a visual and/or auditory handicap, paired with personal buddies, is taking the challenge: a pilgrimage to Santiago de Compostela. Please click on the links to the CWB-teams to read about their motivation and experience. Without being able to see (well), but with blind faith, walking a distance of 200 kilometers from Ponferrada to Santiago de Compostela. We are challenging those with visual and/or auditory handicaps to step out of their comfort zones. To learn to become more confident and less dependent. To learn flexibility, to conquer fear, to think positively, and to dare become part of a team. Active participants are on their way to new possibilities. Radical change requires risking or daring to take chances on being more than you can be. The tradition of the pilgrimage to St. James in Santiago de Compostela goes back to the time of Charlemagne. According to the legend, his tomb was found in 814. For over a thousand years Santiago de Compostela has been an important place of worship in Europe. Pilgrims these days come from all over the world to Spain to walk this famous pilgrimage. The path is called camino de Santiago (The Way of St. James). Every year around 250,000 pilgrims arrive in Santiago. "It is only with the heart that one can see rightly; what is essential is invisible to the eye." A quote from Le Petit Prince by Antoine Saint-Exupéry. It inspires us on our pilgrimage, as without (full) sight, walking the camino can also be an unforgettable experience. You can experience the Way of Saint James with all of your senses. The feel of the sun on your skin, the smell of countryside, hearing the joyful chirping of birds; and for your palate, the delectable taste of the Spanish kitchen. The pilgrims of Camino Walking Blind tell their story why they participate to this wonderful project. STORIES IN THE PRESS. 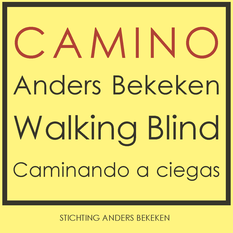 CAMINO ANDERS BEKEKEN is an initiative of Foundation Anders Bekeken. Sofie Mangnus, Séverine Kas and Gert-Jan de Hoon are responsible for the organisation and preparation of the project and the pilgrimage in Spain. As experts in the field of walking and being a pilgrim, and living with a visual handicap, they are an excellent team for the implementation of this project.